I'm always on the lookout for new innovations in tripod mounting. Bogen may offer top-of-the-line gear, but packing a heavy tripod for a weekend trip or a cross town jaunt doesn't make sense. In some cases my bottle cap solution is perfect. 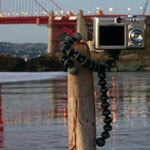 Other times, you need more flexibility, which is where the Gorillapod comes in. I ran across this flexible camera mount thanks to simplehiker and it looks perfect for many awkward camera situations. Three flexible legs provide virtually unlimited configuration options, including wrapping around branches, poles or the railing on the Bremerton Ferry. A mere 1.6 ounces makes this a no-brainer for backpacking and the $25 price tag is easy to grapple with too.